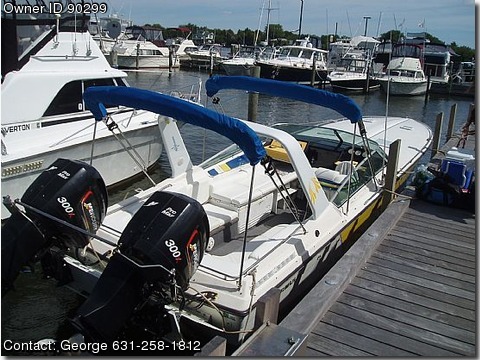 Removed inboards and repowered in 2005 with twin pro max 2002 mercury 300X outboards. They run great and have less then 200 hours and are in mint condition. This added over 8 more feet of useable outdoor space and storage. Over 16 feet in the back of the boat with built in cooler,icemaker and U shaped couch that converts to king sized bedlayout area. Custom Hydrolic Porta Jack plate rated for 900 hpwill hold 3 - 300x's. Boat was surveyed recently at $ 72,276. Completely rewired and all new murcury smart guages. Engines have less then 200 hours and it runs great. Top of the line hyrolic steering that is rated for 900 hp. Custom enron painted white and yellow hull. Every cushion on the boat has been redone and u shaped couch inside converts to king sized bed. This gives 3 sleeping areas on the boat. Custom corian countertops in kitchen with stainless steel sink and microwave. Bathroom with new pumpout head and sit down hot shower ( 8 gallon hot water heater). Great sound system with 10 speakers, 3 amps, i-pod input and 19 inch flat sceen TV. It has 2 bimini tops and converts to a complete camper back with sceens and black out panels for complete privacy. This makes a king sized sleep area in the back. 10,000 BTU air conditiong and heat. Custom radar arch with speakers and lights. I have invested over $125,00 into this boat. You can survey the boat and have the engines checked out and I will return 100% of your deposit if you are not happy with the boat. .